The above figures are for traffic across DMMA member sites. In this modern digital age, one of the best thing you could do for your business or product is to increase its visibility on the internet. Being so pervasive in our lives, the internet makes it easy for people to find and choose exactly you, and to achieve that you will need a comprehensive digital marketing plan. At the DMMA website you can browse and select the best strategy for your products and services, or you could let one of the best digital media companies in South Africa make a detailed assessment of your business and come up with a personalized digital media marketing campaign that is sure to produce results. At DMMA we specialize in digital marketing management, and we have a history of satisfied customers that prove we are the best digital marketing agency based in South Africa. For a business to become successful, the first thing that it needs is a website, and at DMMA we will make sure that yours stands out from the competition. In addition to this, you may want to consider other means of communication with your potential customers, such as creating and maintaining a social media presence, using the pay-per-click method to redirect people searching for you to your website and even display adds on other websites and smartphone apps. Whichever method you choose you can be assured that our digital marketing management team will deliver the best results. Furthermore, we will be there to help you identify your audience in order to tailor advertising messages to be more effective at bringing your company to the next level. To make sure that you and your product stay competitive, our past work experience with organizations like the South African press association has ensured that we stay on top of the game and provide you with the latest insider news and trends. If you choose dmma.co.za as your marketing agency from South Africa, you will have the best digital media marketing team at your disposal. 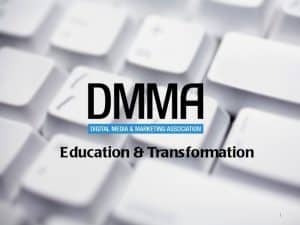 DMMA is an association of members that want to see the Digital era on it’s feet. We are also an independent marketing association, as a result we highly regard copyrighted material. Authenticity is always a priority and for that we have to thank the team at copyleaks.com for always having our back in ensuring plagiarism is kept at bay. In the long run our goal is that we provide a stable platform for learning and commerce in a digital space. At first, this all may seem like a daunting task but that is where our marketing agency in South Africa can be your guide. If you are a new business we will help you target and identify your potential customers, and if you already have an established presence we will make sure you remain competitive and help you expand and reach new buyers. Whichever the case may be, we can ensure you that we can create an engaging marketing strategy and an advertising campaign that will see your product or service get noticed by people.